-In the mean time,prepare the topping.Wash ,peel and core the apples.Grate the apples on the large holes of grater. Add in the lemon juice and keep aside. -Melt 2 tablespoons of butter over medium heat in a sauce pan. Add the grated apples and toss until coated. -Add the brown sugar, flour, lemon juice, cinnamon, and salt. Continue to cook stirring frequently, until the mixture is thick and syrup(took about 10 minutes). Remove from heat and stir remaining 1tablespoon of butter. Cool the filling . -Roll out the dough on a clean flat surface after dusting little flour to a diameter of 10" and 1/4" thickness. -Prick with a fork in between the rolled base.Top it up with the prepared topping and spread evenly with the back of a spoon or offset spatula. -Place it in the oven and bake for 12 minutes first and remove from oven. -Wash the remaining apple and slice it to spread.Spread the thin apple slices and then bake for another 6- 8 minutes until the top slices are baked and the crust gives a nice color. -Remove from oven and cool a bit ,cut into pieces and serve with tea!! * You can add jaggery instead of dark brown sugar. * You can place the sliced apples on top in the first bake itself,if you wish it to be crunchy.I was not sure whether my kids would like the slices so just baked them. * You can even add few nuts or raisins when you prepare the topping. * Add in a scoop of ice cream or whipped cream after cooling the pizza slice and can be served as a dessert too!! hi julie, how are you, i am back to blogging. 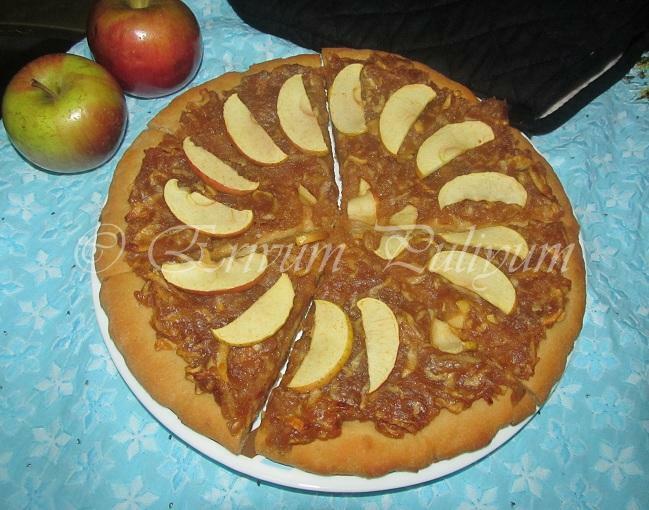 wow so nice to be able to make own pizza, very innovative indeed to use apples. glad you add cinnamon- yes a tiny touch of spice. A different pizza. First time you got it nice. Very yummy and healthy dessert pizza.. I liked that apple topping a lot. Wow I am Really impressed! This looks just wonderful. My family love pizza; what a nice surprise this would be. wow dats a creative dessert...love it !!! Kudos for your first! !I still have to get there :)Looks delicious!! 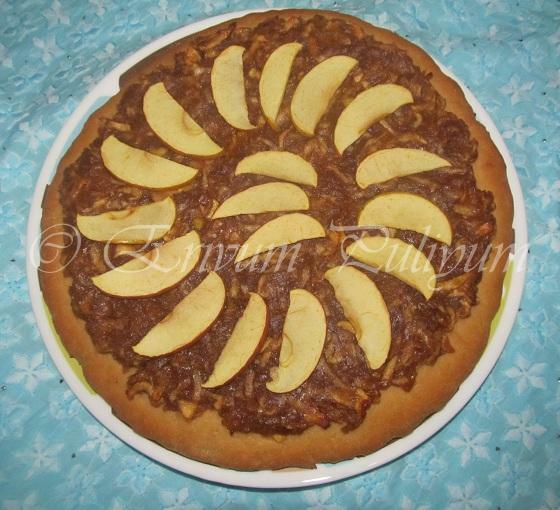 Lip smacking apple pizza, It has turned out amazing. Wish to grab a piece of it. Good job in making your pizza at home. Believe me you will now start to bake more of it. I am sure the kids would have enjoyed the toppings. The pizza did turn put fine. Something differnt ...loved the recipe...ur base have come out so spongy and yum! Absolutely new idea. Never thought of preparing pizza and apple together. wonderfully they worked out. Love this dessert pizza...apples is a great choice! Thanks a ton for linking to the event.. whoa!!! 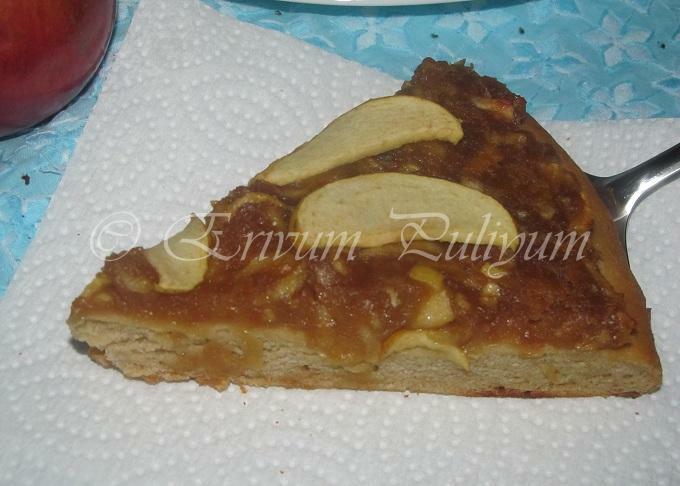 apple pizza??? never thought of that..sweet and sour!!! yummy! Trully Awesome!,Droolworthy Pizza Dear,Healthy n Kid's Special Pizza! This is really amazing. An apple pizza!!!! might have tasted heavenly. Lovely and unique creation. 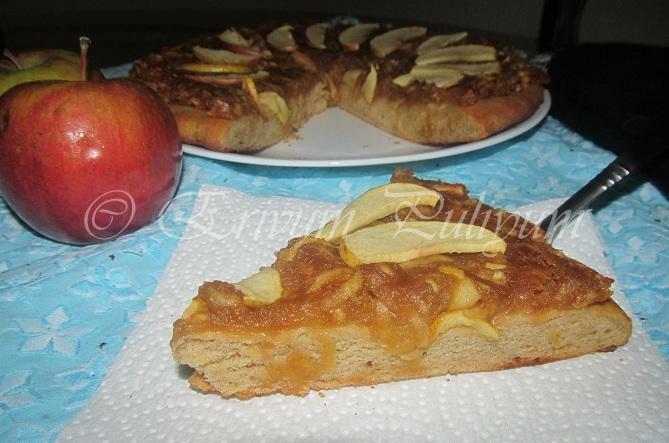 Wholewheat base and apple topping.....yum and healthy.love it!! Sounds perfect and delicious dear..
wow.. love the topping.. and it looks so nice.. thanks for the lovely comments at my blog.. :) ... keep a pizza piece for me.. Healthy and delicious looking pizza. delicious and healthy Pizza...First pizza ia awesome...different one with Apple. This is indeed a delicious treat .. I am a sucker for pizza either savory or sweet! This one looks very tasty especially with the cinnamon in it! Who would have thought this is your first attempt. Wow! very yummy yum pizza, loved the apple topping, healthy indeed !! Interesting pizza recipe...looks beautiful and tasty!! pizza looks delicious... very innovative..
you made it like a pro, Julie!